There are many reasons why cleaning applications in Mac App Store are in demand. Their ease-of-use and host of features come in handy for the non-techie users. Doctor Disk Cleaner is a relatively new maintenance tool launched by Systweak Software. Where does it hit and miss, we will find out in this review. As said earlier, the ease-of-use is one of the main reasons for the popularity of cleaning applications. The user interface of Doctor Disk Cleaner takes simplicity to new levels. Every feature is easily accessible. The layout is minimalistic and clean. All the tasks can be accomplished with a few simple clicks. Its clean design is welcoming. The quick-access menu can be launched by clicking on the Doctor Disk Cleaner’s icon resting on the menu bar of the desktop. It comes with two sections, Memory Optimizer and One Click Cleaner. 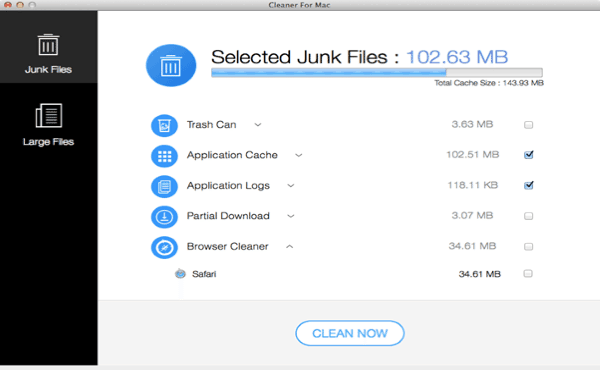 The quick access menu shows the amount of available memory and the list of apps using most of the memory resources, and one click cleaner informs you about the total junk files collected in your Mac. The features such as Quick Clean and Optimize can be used through this menu, and you don’t need to open the application every now-and-then. The included modules are more or less the same in all cleaning applications. What makes an app stand-out is the effectiveness with which an application performs the desired tasks. To be precise, Doctor Disk Cleaner covers all the basics. Thanks to the presence of Doctor Disk cleaner’s icon on the menu bar, you can manage your Mac’s memory and clean the junk from your Mac. Doctor Disk Cleaner scanned my Mac for Junk files in not more than a minute. The total cache size came out to be 143.93 MB. The files were grouped as Application Logs, Partial Downloads and other segments shown in the screenshot below. You can click on any of the categories to see the list of files it contains. You can either select the entire group, or see its content and select multiple files for deletion. ‘Partial download’ shows all incomplete downloads and ‘Browser cleaner’ enables users to remove cache, browser history, cookies, saved passwords etc. from all the browsers (such as safari and Mozilla). 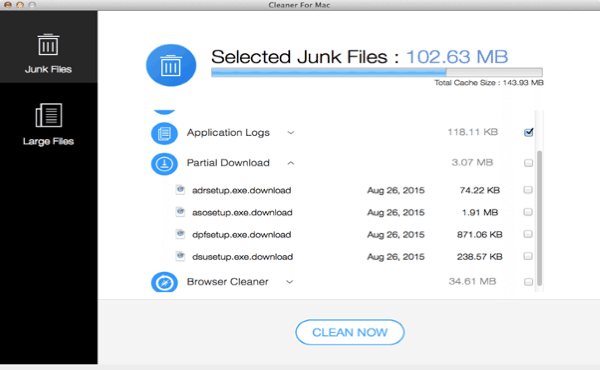 Removing junk files won’t give any sort of boost to your Mac’s speed. It’ll just make your Mac light on storage. The name ‘Large Files’ may keep you wondering about what this module exactly does. It scans your disk to find large files and categorizes them in file types. Video files were occupying 16.24 GB of hard-disk space which came as a surprise. I never knew where such video files were hiding. And most of the video files were duplicates. If you save your files with appropriate titles and not with movie1, picture¬¬_435534 or other abruptly typed names, it would be easier for you to go through the list of files grouped together and select only the unneeded files for deletion. There is a filter option (shown above in the screenshot) that you can set according to the size of files you want to delete. I used the default size that is 100 MB and hence, the application showed me all files that are greater than 100 MB. 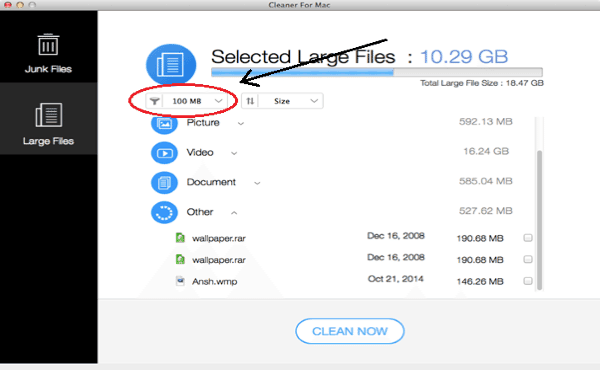 Doctor Disk Cleaner simply does its job of removing junk and other unwanted large files from your Mac without scaring with terms such as ‘high risk’ or ‘danger’. Having said that, I would have liked some extra features such as a duplicate file remover utility. 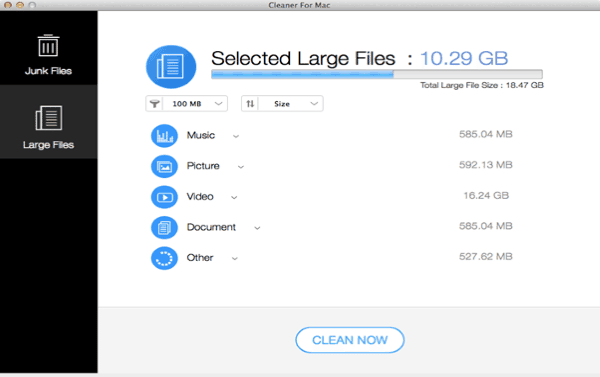 It is definitely one of the simplest and most effective applications for Mac cleaning I have ever used. Recommended without a doubt. 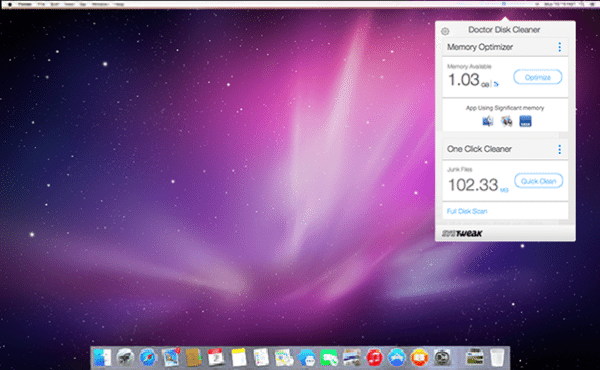 Click and Download Doctor Disk Cleaner for FREE on Mac App Store.